By Byron Reed for 9News | For Abraham Lincoln High School senior Giselle Galvan, a little advice can go a long way. Galvan is taking a tour of Emily Griffith Technical College to think about what she wants to do after graduation. “It’s better knowing to go into that career with some background knowledge than going into it without knowing anything,” said Galvan. Galvan is one of 125 students from Denver Public Schools taking part in Discovery Day sponsored by the Denver Scholarship Foundation and supported by the Daniels Fund and the Anschutz Foundation. They are working with DPS students who may not otherwise pursue post-secondary education. 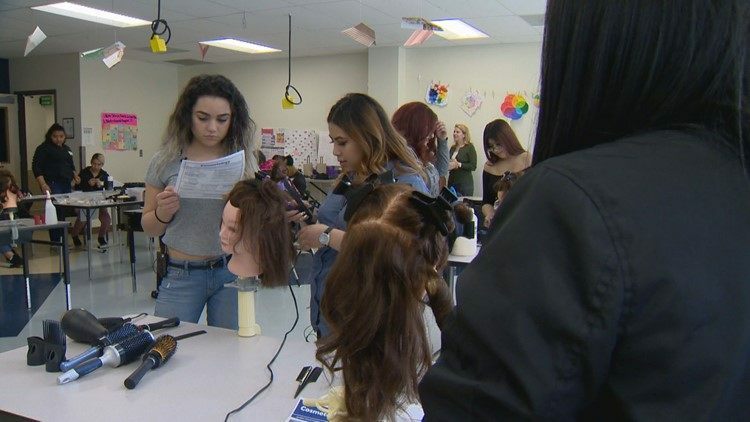 The idea is to give high school seniors a chance to explore career choices like cosmetology, certified nursing assistant and even massage therapy. The tours also gives students like Bruce Randolph School senior Brandon Perez an opportunity to fulfill a dream. “I will be the first one in my family to go to college, so I think it will be really good,” said Perez. Discovery Day helps students explore future possibilities with a little helpful advice. “We believe in helping those kids see their future and to make it to college and to a career path,” said Brittany Matteson, Denver Scholarship Foundations Career and Technical Program Education Manager. Denver Scholarship Foundation's Scholars are all low-income students – 70 percent of whom are first-generation college students. They receive scholarship support to assist in getting their certificates, associate’s and bachelor's degrees and stay in Colorado while attending a wide variety of universities, colleges and technical schools throughout the state.